Anyone curious about the Virginia basketball team’s response to its first loss of the season didn’t have to wait long for the answer Tuesday night. The Cavaliers exploded out of the gate to take a 25-3 lead and never really let Wake Forest back in contention en route to a 68-45 win. 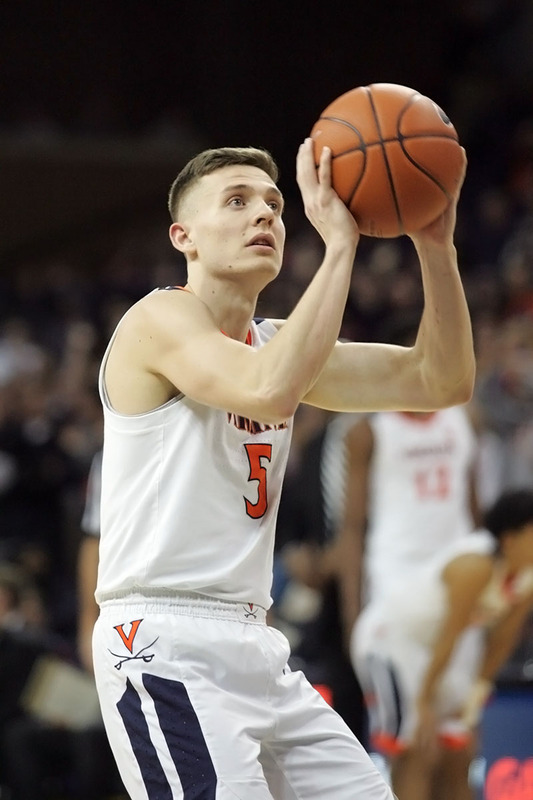 UVA guard Kyle Guy said it was clear from just looking around that the team was ready to play, even though no one actually said anything to set that tone. “Nobody really verbally said it, but you could look in everyone’s eyes and you could tell that we were really hungry and really ready to play this game,” Guy said. So ready, in fact, that the Hoos (17-1, 5-1 ACC) roared out to a 12-0 lead in the first three minutes. After Wake finally cracked its scoreboard goose egg, the hosts poured it on again. This time, they uncorked a 13-0 surge in fewer than four minutes to establish that early 25-3 advantage. Mamadi Diakite provided the initial spark for the Wahoos. He scored the game’s first seven points during the first two minutes. He ended up with 11 points, 7 rebounds, 1 blocked shot, and 1 steal in the win. Those 7 rebounds matched a career high. If Diakite set the fire in those early minutes, De’Andre Hunter and Jay Huff added more fuel to it. Hunter sandwiched 7 points around a Guy 3-pointer, while Huff checked in and instantly scored 8 points in a little more than two minutes. Hunter matched Diakite’s line with 11 points and 7 rebounds, while chipping in 5 assists and 1 blocked shot too. Huff scored 12 points, his ACC best to date, to go along with 2 rebounds and 2 blocked shots. The Cavaliers ended up with five different players in double digits. In addition to Diakite, Hunter, and Huff, Guy and Ty Jerome contributed to big scoring totals. Guy posted 12 points, 4 rebounds, 3 assists, and 2 steals, while Jerome tallied 10 points, 3 rebounds, and 5 assists. That proved to be too much for Wake Forest, especially after the fast start. The Deacs tried to claw their way back into it with 20 points in the final 8:48 of the first half. Olivier Sarr scored a bucket to finally end the early onslaught, which led to a mini rally from the visitors. Over the next several minutes, they converted fastbreak chances and 3-pointers into a run that closed the gap to 36-23 by intermission. Brandon Childress helped his team respond with 8 points in the final 4:40 of the first half. Childress finished with 12 points to lead his team. He also had 6 rebounds and 3 assists. Sarr was the only other player in double figures with 11 points and 8 rebounds. Virginia coach Tony Bennett said the team played amazing basketball in the early moments Tuesday, but then ceded some of the momentum back with some hasty shots and decisions. The Cavaliers didn’t let the late first half slip turn into a nervous second half, though. The Demon Deacons never got closer than the 13-point halftime deficit after Jerome canned a 3-pointer in the first minute of action. The only drama in the second half turned out to be a personal milestone for Guy. The junior guard knocked down a pair of free throws to pass the 1,000-point mark in the win. He’s the 48th player in program history to reach that mark. He also passed Malcolm Brogdon on the career 3-pointers list (Giuy is up to 188 made 3’s, while Brogdon had 185).